APSRTC online ticket booking makes bus ticket booking very easy. Now you can book ticket of any APSRTC bus from anywhere in just few minutes. Though there are many online bus ticket services, but through them you can only book tickets of some private bus service. But now with APSRTC online booking system, you can also book bus tickets of Andhra Pradesh State Road Transport Corporation buses. For apsrtc online reservation, you first need to get APSRTC login account i.e you need to register on APSRTC first. Then you will get your login credential for APSRTC website. Now you can book bus ticket online for Andhra buses. Let’s look for step by step procedure to create account on Apsrtc and how to book apsrtc tickets online. If you are planing for some trip on Andhra, and want to know bus roots and ticket availability, then APSRTC website is the best idea. To book bus ticket online on APSRTC, just follow the below steps. To create login account on APSRTC , follow the below steps. First Go to Apsrtc Signup link to create account on APSRTC. Now fill this form with all the necessary details. You need to provide all details like your Mobile Number, email id, and any govt approved id. Now Click on Submit button, you will get your APSRTC login id and password on your mail. Open your mail and login with your user id and password. It will ask to change password, just create a new password. You have successfully created account on APSRTC. Now you can book Bus ticket online on APSRTC website. To check bus ticket availability on APSRTC, you do not need APSRTC login account, you can directly check APSRTC reservation availability. Now just enter your origin city in From and destiny city in TO. Now enter your journey date. Now click on Check Availability button. Now it will show all the bus available according to your search on that date with the number of ticket or seat left in the bus and the time of departure and reaching time. You can further filter your search with the Bus type, AC or Non AC , boarding point etc. Now you have created account on APSRTC, you have checked your bus ticket availability on APSRTC. Now just select the bus that suits you. Now it will show the seating arrangement of bus , with seat availability. The seat which are Grey is already booked, red seats are meant for ladies and the WHITE means available seats. When you chose a seat get turns green. Now its turn to enter passengers details. Now enter passenger name, mobile number, mail id, Gender and age. Now click on continue button. It will redirect you to the payment page. Here you can select your payment type. Just select your suitable payment option and click on Make payment. It will redirect you to payment gateway. Now enter your card details or net banking and complete the payment step. It will again redirect you to APSRTC website with a message of successful ticket booking. Now you can take print of ticket. See its that easy to book bus ticket online on APSRTC. 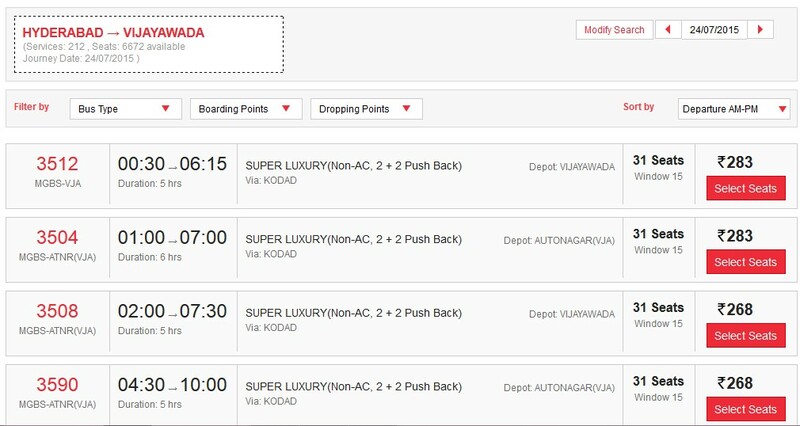 Now you can book any bus ticket of ANDHRA roadways bu just sitting at home at your couch. Even you can also book APSRTC bus ticket from your mobile, they have also build a dedicated android app for it. There are some popular roots of Andhra Roadways, where you will get frequent buses. APSRTC is giving very good service to public, they have toll free complaint and inquiry number also. Where you can log a complain and can inquire about the different buses. Its good for people that do not have net access. The APSRTC customer support is available 24/7. 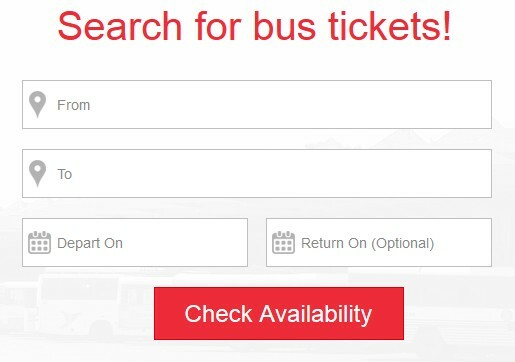 Now you can book bus ticket online on APSRTC website for Andhra roadways. You have learn the APSRTC online ticket booking procedure. But if you still have any query related to APSRTC ticket booking, you can ask your query in comments. Our team will try to help you in every possible way. And do share this post with your friends and relatives, so they can also do APSRTC online reservation.